Got the bug for a little wine country travel? 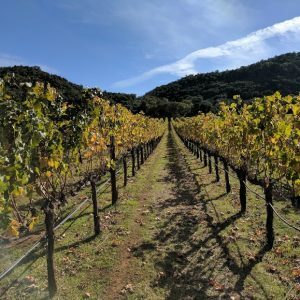 Over the years, I have sent numerous clients and friends advice and recommendations when it comes to wine country travel. Whether it be wineries to visit, favorite restaurants or hotel recommendations or just a list of ‘must dos’ when in these regions worldwide, many of you have delightfully reported back and told of your exquisite excursions and shared pictures, stories and more of your adventures. 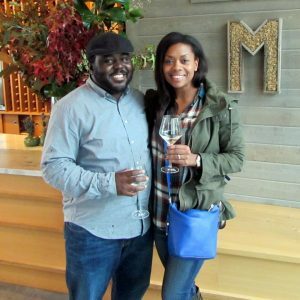 One couple’s, however, was just too fun of a story to not ask if she’d share her entire wine country travel with Amusée readers. 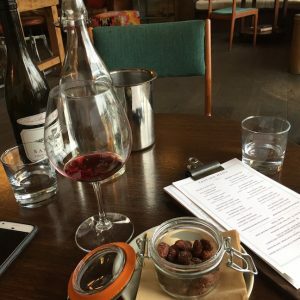 Not only did she take on the recommendations that I had offered of food, wineries and more – she had SO many other fun experiences that I loved hearing about! 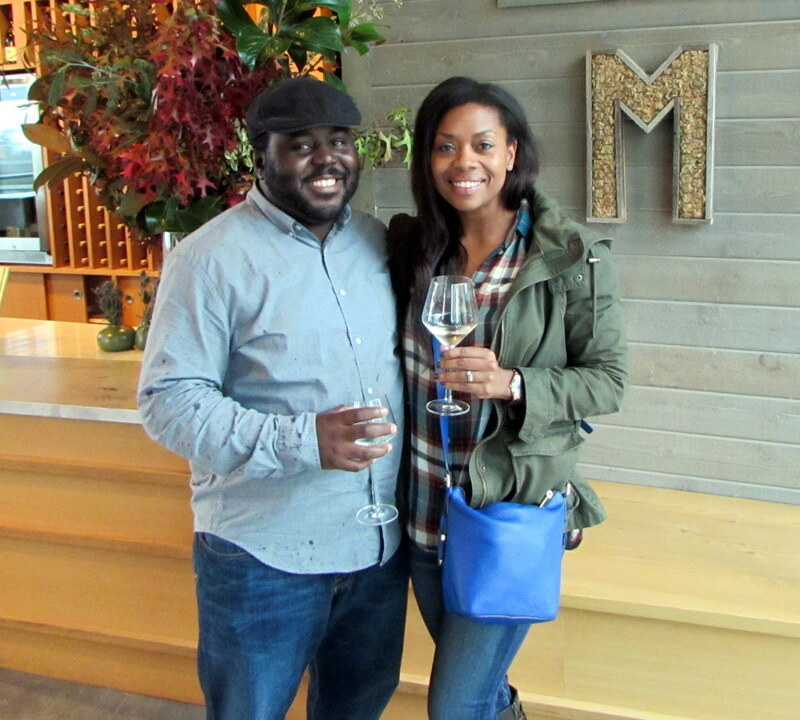 So without further adieu, here is the lovely Ms. Jennifer Ray-Jones & a recap of she and her husband, Chioke’s, trip to the wine region of Sonoma! Hello fellow lovers of vino! I spent three glorious days in Wine country with my husband after some quality time in our favorite city San Francisco. (P.S. We saw Kevin Durant!) I am thrilled to share the highlights of our adventures with you. I will begin this tale of wine and more wine on a bright and early morning on our first full Sonoma day. The importance of breakfast should not be underestimated. Especially when after said breakfast copious amounts of wine will be ingested. 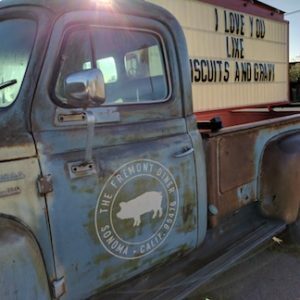 The Fremont Diner is a bit away from the “hustle and bustle” of Sonoma and gives the impression it is sincerely a local’s establishment. 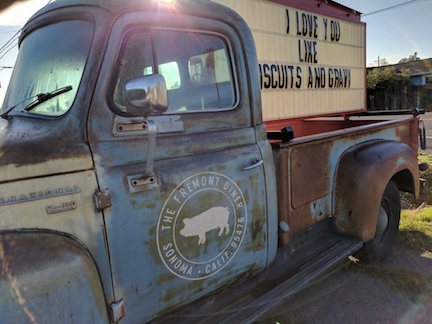 Turning into the parking lot we were greeted by a rusted old truck holding a sign in its bed, which read “I love you like biscuits and gravy.” You can’t go astray with light, flakey and buttery carbs. Cue salivation. This was a quintessential diner with a kitschy vibe, think retro Coke bottles on display, water served in mason jars and vintage tiled floors. Our French press coffee was even served in a thermos! 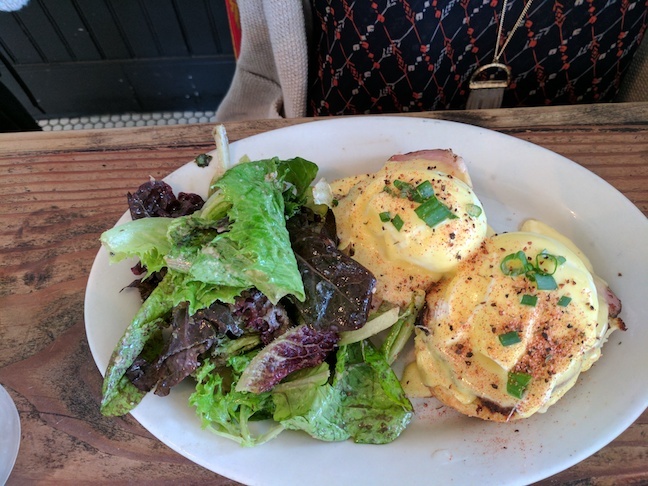 We ordered eggs benedict and fried oysters with scrambled eggs as our sustenance. Plus extra biscuits, obviously. 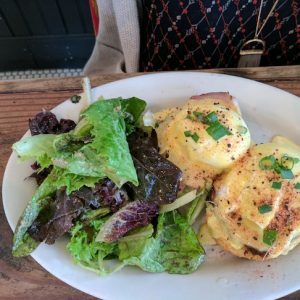 Southern staples such as chicken and waffles, andbiscuits and gravy were also on the menu as well as standard breakfast fare like scrambles and hash, often upended with a little Cali flare such as avocado toast. Umm…Excuse me…Could we get another biscuit please? After building a solid base we progressed to our first winery of the day, Hendry Winery about 5 miles northwest of downtown Napa. There was something immediately comforting about Hendry when we walked through the door. It may have been because it was an old farmhouse that had been meticulously transformed. Or maybe it was the family photos that showed Owner and Winemaker, Mr. Hendry, as a child. Or maybe it was the coffee table book entitled “Wine Dogs of California.” Whatever it was, we immediately felt at home and welcomed. I had signed us up for the 3-hour Seminar Tour, which was an intimate tasting and wine education experience with Mr. Hendry. I can’t emphasize enough that this was the single best grape to glass instruction I’ve received from any winery or wine class for that matter. It’s not an everyday experience to have a winemaker discuss not only the technical side of winemaking but the personal side as well. He discussed his family history as plum and dairy farmers, the transition to growing grapes and the trials, tribulations and success that followed as novice winemakers. 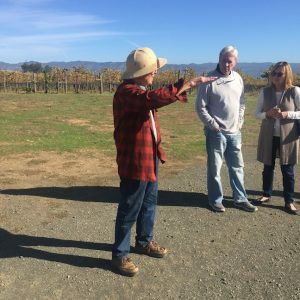 The small tour group of eight ranged from those just getting into wine to a couple with a plethora of Wine country trips under their belts. 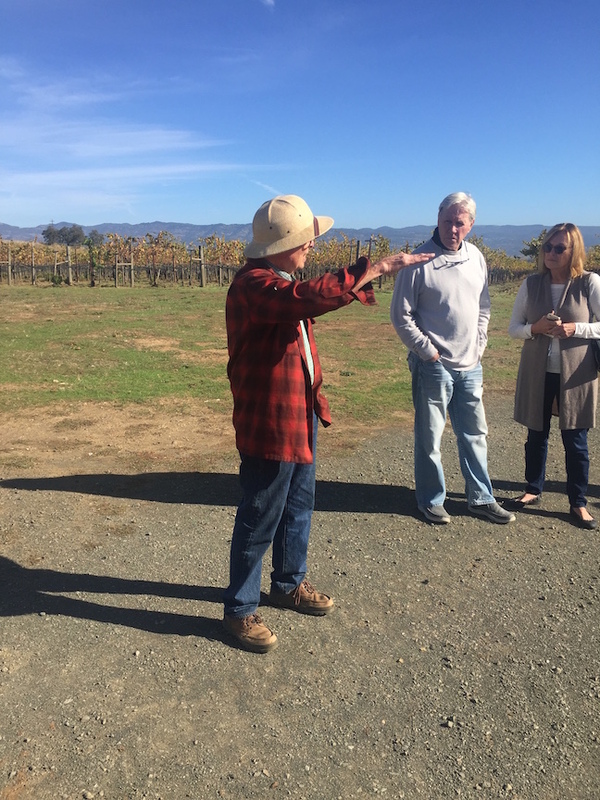 Mr. Hendry answered every question we threw at him and explained the processes of harvesting, sorting grapes and fermentation. I also learned the answer to that age-old question regarding capped vs. corked wines: Corked wines still need to age while capped wines are made “finished” and can be drunk immediately. Mind blown. After touring the property, fermentation, and barrel areas we settled back in the tasting room. Sitting at a long dining room style table with elegant place settings, Mr. Hendry began taking us through a multitude of tasting exercises. He poured wines of different acidities, sweetness, dryness, tannins, and complexities. We were able to understand why some wines absolutely need food alongside it and exactly why and how our palettes become fatigued. Drinking say an acidic wine followed by a delicate wine renders the tasting notes of the later almost indiscernible. And the chemical response in our mouths that occur while tasting and pairing wine with food was an eye opener to everyone. Might I add, the wines were also delicious. Its also worth noting this vineyard was the most diverse we visited that day in terms of breadth of grape varietals, growing Albariño, Pinot Noir, Chardonnay, Zinfandel, Merlot and Cabernet. We bought twelve bottles so I would deem this as a successful visit! I was a nervous wreck by the time we got to Chappellet Winery. The narrow winding roads we drove kept heading higher and higher into the hillside and thoroughly tested my low threshold for increased altitudes. On the other hand the landscape was beautiful, with rolling vineyards gently changing color under the controlling hand of Fall and a brilliant Lake Hennessey. At least if I had died I would have done so having seen something breathtaking. To our luck, we ended up at the large glass doors of the winery with life and limbs intact. Art gallery…this place reminds me of an art gallery, was my first thought as we walked in and gave our names to the host. We waited on a very ornate, wood-carved bench until our tour guide called our names. Barrels of wine stacked three high lined the massive and open space of the winery like small walls as our guide weaved us in and out discussing the winery’s history. Owners Mr. and Mrs. Chappellet were the first to plant vineyards exclusively on the vastly elevated hillside called Pritchard Hill. We learned that because of this particularly unique terroir, the wines produced had specific intensity as well as depth. I was also vindicated to find out Mrs. Chappellet had been an artist and had designed the entire winery herself. We tasted through several varietals including our first Chenin Blanc of the trip, Chardonnay and Zinfandel as we explored both the outdoor vineyards. Back inside we gathered at a large table still amongst aging barrels of wine and continued to imbibe on Cabernet Franc and Pinot Noir. As we sipped, we discovered the other participants in our tour group hailed from Minnesota and also Wisconsin, proving you can never go too far without finding a few fellow Minnesotans. Due to the bottle of wine we ordered at dinner the night before at the somewhat disappointing La Salette Portuguese restaurant in Sonoma’s square, we got ourselves ready slightly off schedule. Our punishment was breakfast in the lobby of our hotel. (Though it actually wasn’t too bad!) Far better than the cold bagels and OJ my husband was convinced we’d get, but real food – homemade (well, I saw it come from a kitchen!) mushroom and artichoke frittatas, fresh fruit, and chocolate mocha muffins. After breakfast, we met our 2- time driver and wine country expert Damon for the wine excursion ahead. We first met Damon five years ago when we took a wine tour for our honeymoon. Once I’d officially booked our trip, I immediately sought Damon’s services again. The morning was dreary and there was a light rain when we reached the entrance of Benovia Winery. The winery, open by appointment only, was sophisticated, intimate and very quiet. It was the type of formal setting that immediately sharpens your posture and leaves you pondering if you’ve underdressed. 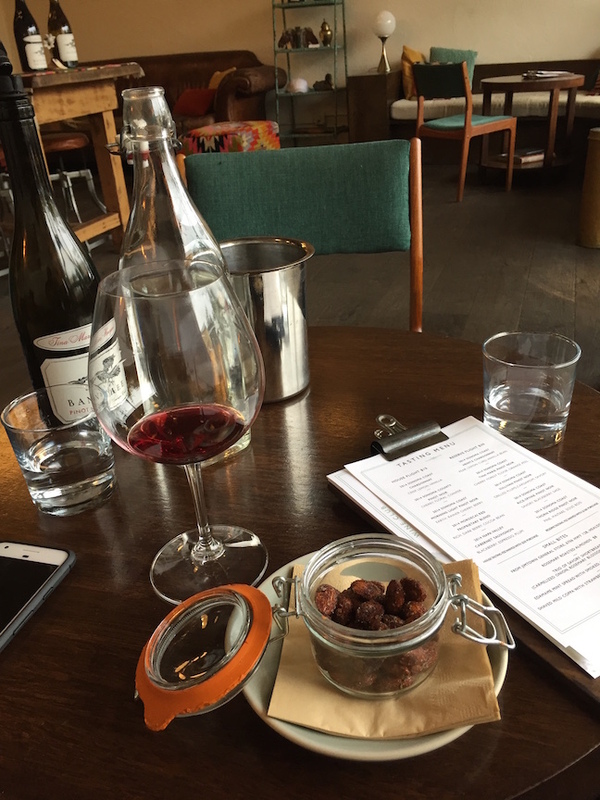 The slight feeling of unease lifted nearly immediately when I glanced to my right and saw a long and glossy dark wood table with 2 sets of bulbous pinot noir glasses and six beautiful wine bottles. Am I the only one that gets a slight chill of excitement when I’m about to taste wines I’ve never had before? Lauren, our host, began pouring us 3 chardonnays and then 3 pinot noirs one at a time. She would be the only host whom I’d remember by name as she was the only one to send us a very sweet email thanking us for coming to the winery and ensuring we’d received our wine purchases. The chardonnays and pinots we were enjoying would soon become the narrative wines for the duration of the day, as they are the specialty in the Russian River Valley and Dry Creek regions. Although we enjoyed the chardonnay, the pinot noir was pure heaven. It was balanced, robust and had phenomenal mouth feel. 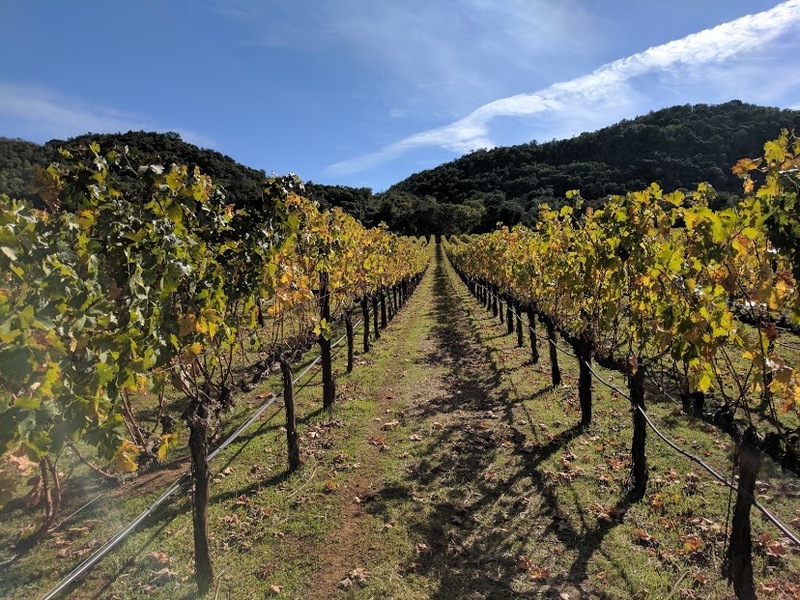 Through our conversations with Lauren we learned Benovia practices sustainable farming and owns 3 vineyards – Cohn Vineyard in Healdsburg, Martaella Vineyard outside Santa Rosa and Tilton Hill just off the coast of the Pacific Ocean. Unfortunately, the 3 of us had so many random conversations about wine (and beer! ), what gems Lauren had in her wine collections, and how she got into the business that my notes above were the only things of true substance we learned about the winery…at least what can be remembered. Regardless, we enjoyed our visit and being the only people in the tasting room left us feeling well-pampered. I like this place. I like this place a lot. I’m a sucker for most things hipster…but hipster PLUS great wine? Day made. 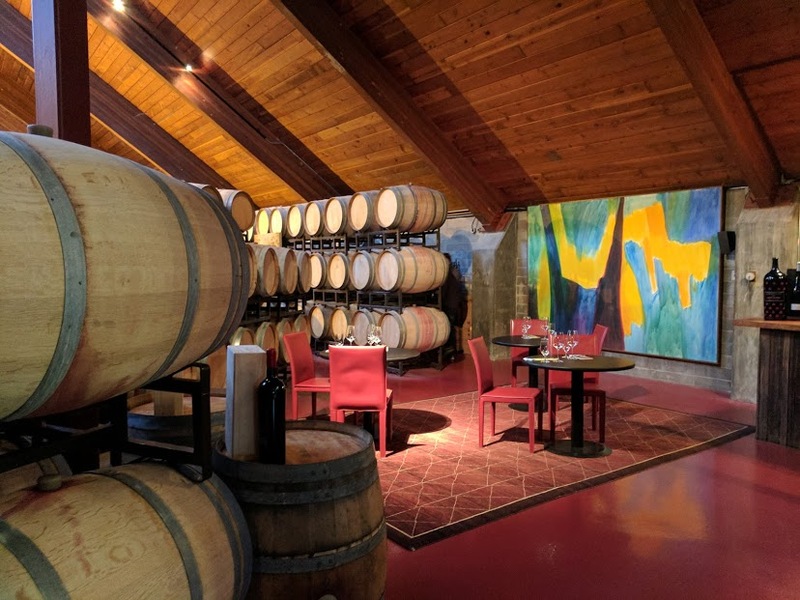 The formal tasting experience at Benovia could not have been more contrasted by our stop at the tasting room of Banshee Wines in downtown Healdsburg. With dark hard woods, mid-century modern décor, muted coloration and cozy seating, this is a place where you can really hang out. The persistent rain (and that fact it was Monday) left the tasting room empty and we had full run of the place. Banshee, like Benovia is a pinot noir focused winery. They do not own vineyards themselves but have strong partnerships with growers in the area where they purchase grapes. A key influence in Banshee wines is to highlight flavor differences garnered from each Sonoma Coast vineyard’s individual terroir within the same varietal. Our hostess (so awesome!) guided us through a tasting of five wines, which included a chardonnay and four pinot noirs of which we tasted side by side. I’d never tasted a single varietal from four different vineyards at the same time. Although I’m still working on refining my palate, the differences elevation, sun and a few miles apart make on the flavor and aroma of wine never cease to amaze. Because we were the only patrons there, and the surroundings were so comfortable, we lingered a little bit longer and the hostess graciously poured us samples of their sauvignon blanc which was not on tasting menu- definitely a fresh and bright way to end a great experience. Oh, and if you do nothing else at all, order the rosemary almonds. You’re welcome. After Banshee, we walked about a block for a quick and delicious lunch at Willi’s Seafood. Perfectly fried calamari, fresh fish tacos, barbequed oysters and ‘cast iron’ fish and chips – inventively made with salmon instead of the typical cod or other white fish rounded out our pit stop. Cocktails may or may not have been ordered. Hey, it’s vacation! Plus we needed to keep our palates sharp for more wine. As we were walking back to the car, I saw a woman with a white paper bag from a bakery called Mustache Bakery. What a fun name, so of course we had to stop there as well for cupcakes (for the road!) and some espresso. It was a quick drive to Peterson Winery, which is actually nestled almost in a cul-de-sac with several other small family wineries. What a relaxing and informal experience we had at Peterson. No reservations needed, we walked right up to the bar for a tasting. Peterson aims to produce “no-soulless” wines, and they prevail big time. 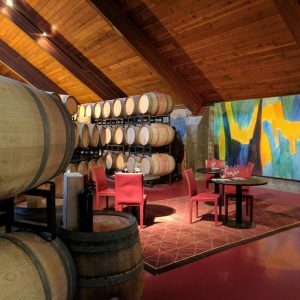 A winery with range, Peterson produces tons of different wines including Syrah, Cabernet, Grenache, Sangiovese, Sauvignon Blanc and everything in between – a definite departure of the Pinot Noir focus we’d seen that day. During the middle of our tasting I mentioned we had been sent to Peterson by a local sommelier in Minneapolis (Leslee from Amusée) and that if Fred Peterson (Owner) happened to be around we’d love to say hello. Is it just me that feels a bit strange name-dropping even when you were encouraged to? Either way we were in luck, Fred was in the building! He was so gracious talking to us for nearly an hour, explaining how he got started in the wine business and how committed he is to displaying a sense of time and place in his wines and staying true to the nature flavors of the region. Fred is like the grandpa you always wanted! “You must’ve made friends,” Damon, our tour driver mentioned given the length of time we spent. “Yes, we definitely did.” I answered, and we were off to our last stop of the day. It’s really hard not to like a winery that greets you at a set of massive doors with a glass of juicy sauvignon blanc, which is exactly what happened upon our arrival. We graciously accepted the glasses from the outstretched arms of the hostess and were ushered into a mid-century modern tasting room with massive windows and a ceiling that went on for days. A surfer-type gentleman with long curly hair held back by a thin headband guided us through a tasting of 3 pinot noirs and 3 chardonnays, one of which our host aptly referred to as a “porch pounder.” We laughed at his description. However, once we tasted the wine, complex yet drinkable and fruit forward with a mineral edge, I immediately was able to envision myself on a porch happily pounding this wine. The MacRostie tasting room is known for the expansive and breath taking views of its vineyards and the mountains, and has 3 outdoor patios in which your eyes can take it all in. Unfortunately, the inclement weather of the day wrought with fog and precipitation made it near impossible to enjoy the sights or take advantage of the patio. Another reason we will be back! While we enjoyed the wine, the experience was less personal than our previous stops and we didn’t learn as much about the winery and its history with the basic tasting. Finally some Napa Valley nightlife! In the past, we would’ve been under too intense of a wine fog (you know what I’m talking about) after an entire day of wine tasting for a late night round two. But our restraint sharing tastings for the most part paid off and we were ready to go. After a dinner of thin crust pizza and apps at the nearby Southern Italian restaurant Oenotri, we waltzed right up to the bar of Cadet without a wait. The menu, although very impressive especially for beer and wine by the bottle, was slightly lacking in by the glass options for wine. I decided to use that as an opportunity for a flight of three sparkling wines. You can never go wrong with bubbles. Never. As we hung out at the bar, taking in the dimly lit ambiance and good music it started getting a bit busier. My husband indulged in a couple rare beers- the first 2013 Wild Ale from The Bruery and then Belgian white ale from the Japanese brewery Yo-Ho Brewing. 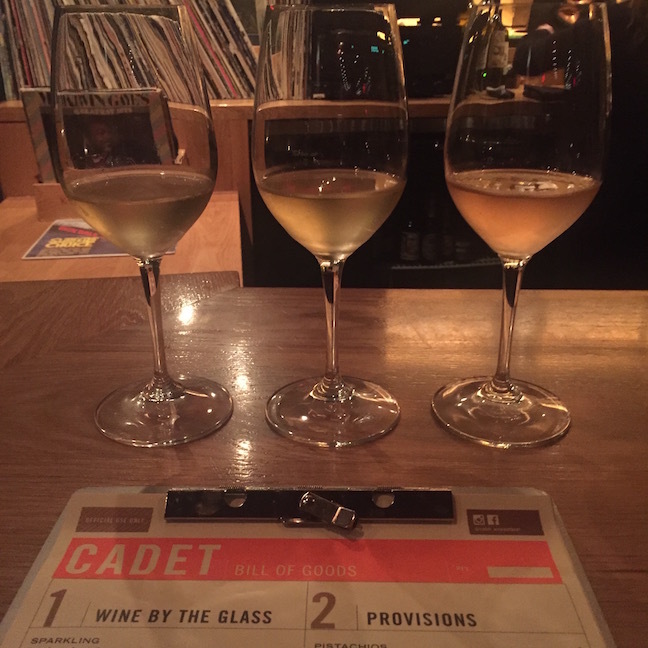 One interesting aspect of Cadet was that if you purchased a bottle of wine you could select a record to be played. That retro L.L. Cool J record was staring me in the face, begging to be played, but I couldn’t commit to a full bottle. Luckily a couple next to us did purchase a bottle and selected Marvin Gaye, what a perfect ending to a phenomenal trip.